I think it's very interesting when I find a Hamilton model changes slightly over different model years. New dial patterns are introduced or removed, hands might be changed, even the movement can be changed. Take for example the 1958 Deauville. It was produced for three years and in the third year the dial was dramatically changed (for the better). 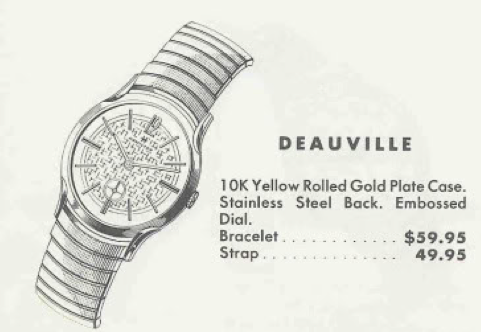 In 1958 and 1959, the Deauville dial was a plain embossed dial with markers and numerals. The hands were a pointex (aka alpha) style. Then in 1960, the dial was changed to a more decorative embossed dials with numbers at 12 but markers everywhere else. The hand style was changed to a baton style. 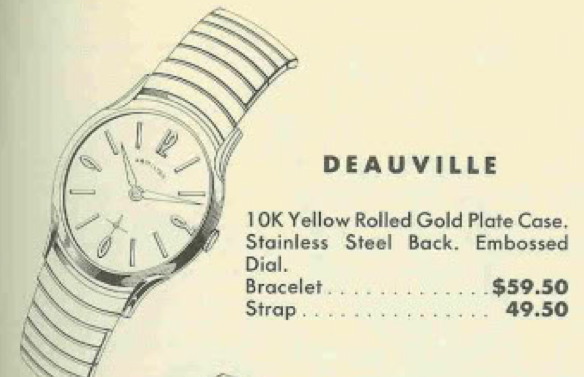 Regardless of the model year, the 10K yellow rolled gold plate case was the same. Tucked inside is a Swiss-made Hamilton 673 movement made by A. Schild. I recently received a very nice example of a 1960 Deauville. You can tell it's a 1960 because of the textured dial. It sort of looks like a woven cloth or parchment. I think it's way more attractive than the plain dial in the 1958 / 59 models. The stainless steel back has a little lip between the lugs - a clear indicator that the back will pop off to open the case. Without the crystal and bezel in place, the decorations on the dial are clearly evident. I would hate to try to get this dial refinished - I bet it wouldn't turn out as nice as this original example looks. The 673 is a straightforward manual winding movement. If you've followed my blog for a while, you'll probably agree that this a commonly used movement for Hamiltons from the late 1950's and early 1960's. Everything gets taken apart and thoroughly cleaned before being reassembled with fresh oil and lubricants. There's no complaining about this watch's performance. And here's the finished product, all polished up and looking as great as it runs!